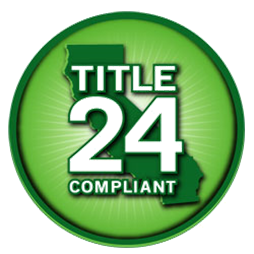 The new Title 24 changes have been in effect for a month now and there is still some confusion on how this will affect construction. By 2020, all new California residential construction will be zero net energy and low income homes will be energy efficient. By 2030, all new California commercial construction will be zero net energy. Also, the HVAC industry will be reshaped to ensure that the equipment is performing to the new standards. These new changes affect various aspects of the building process. Unvented crawlspaces need vapor barriers and HVAC bypass ducts are not allowed. Frame wall insulation must be a minimum of R-13. Ceiling and roof insulation must be a minimum of R-30 unless it is an addition, which must be a minimum of R-19. For residential bathrooms, a minimum of one high efficacy luminaire must be installed per bathroom. All other lighting in the room must be high efficacy or controlled by vacancy sensors. These sensors and high efficacy lighting will be key in all residential applications. For non-residential, all luminaries mounted less than 24’ above the ground will require motion sensors. With any change there is always an adjustment period. It is key that you, your subcontractors, and your suppliers adhere to the new standards. For more information, visit www.energy.ca.gov/title24/.